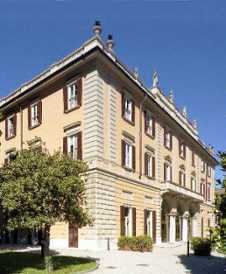 Built for the Abbot Marco Gallio on the site of Paolo Giovio's sixteenth-century villa called "The Museum", it dates back to the beginning of the seventeenth century. It has a simple layout, with two loggias on the ground floor, one facing the lake and the other facing the mountain. The architect who designed the villa remains unknown as do the artists who painted the frescoes in the hall although they have been attributed to the Recchi brothers and Isidoro Bianchi. It is currently the head quarters of the province of Como's government offices. nother type of therapeutic flight that can only be done in seaplanes is for a fear of flying. The seaplane that flies above the water can return to the surface, in a few seconds, thanks to this fact the confidence of many people with this phobia is increased. The steps to flying can be taken gradually and reassuringly, always with at the discretion of the passenger if they want to return to the surface. It's left to say that based on experience at Como, the possibility of such a safe experience is rarely unsuccessful in curing to at least some extent the fear of the passenger. We have had very few passengers who have requested to return to the water surface, and for the record none of them exploded into a state of panic, screaming and crying. Sometimes a member or guest of the club, requests to be taken to the shore near an event, for a party or gathering of friends. This unique way of arriving at an event helps leave a lasting good impression that is made even better if the pilot offers the other guests a short flight around the lake. For those who express an interest in signing up to a flying course, the club offers a 'trial flight' sat in the command seat, with an instructor on your right. The future pilot can try the principals of flight manoeuvres after a theory briefing, in order to give a more complete experience. The club with its objective to research more and more occasions to promote aviation, has in the past, proposed flights for valentines day, aimed at couples wanting to experience the emotional flight experience together, promoted by the slogan ' Baciatevi in indrovolante', kissing in a seaplane. Some people have chosen to propose marriage in flight, to then pass this special moment together surrounded by the most beautiful surroundings. Couples taken on flights on Valentines day. On the left the couple who got engaged at 300 feet above Bellagio, an event celebrated with kisses and a bottle of champagne. There are countless birthdays and anniversaries that people want to spend on board a seaplane flight. The most popular being anniversaries of marriage, sometimes couples even open a bottle of champagne mid flight and propose a toast. Many older people, take a flight, having expressed after much thought that they would like to try something different, and that they have never done before, or even to see their hometown from altitude. 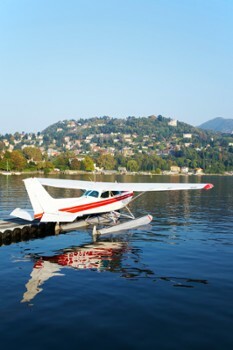 The law allows many people to scatter the ashes of their loved ones from a seaplane, generally into the lake or over a place of specific significance. 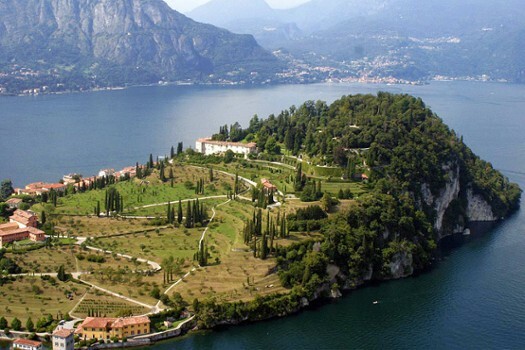 Many high-end guests rent houses on Lake Como, wishing to experience life on the lake. It happens that some people who see the seaplanes passing backwards on forth, sign up as members to the club, and show up everyday wanting to be transported with their friends and families for runs on the lake. 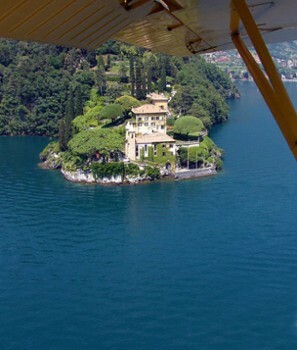 Sometimes, tourists that are passionate about aviation don't even know about the existence of the Aero Club Como when they plan to visit the lake. When here they follow the flight path of the passing seaplanes in order to find the point of departure. Ultimately finding a hangar full of seaplanes, a pleasurable discovery that allows them to experience something really unique. 140 Euro for 2 people lasting 30 minutes. Nearby Things to Do include: Towns such as Brunate and Cernobbio; Castles & Ruins such as Broletto and Como Gate Tower; Monuments such as Como War Memorial and Monument to European Resistance; Villas such as Villa Gallia and Villa Saporiti; Churches such as Como Cathedral (Duomo) and Sant'Agostino; Museums such as Volta Temple and Museum and Casartelli Science Museum.